The beginning of a series of clips featuring season three's legendary recurring patient, Mrs. Hufnagel. Mrs. Hufnagel's (Florence Halop) reign of terror at St.
and Dr. Cavanero (Cynthia Sikes). In the second episode of season three (1984-85) of St. Elsewhere, the hospital is feeling the effects of the impending nurses' strike. 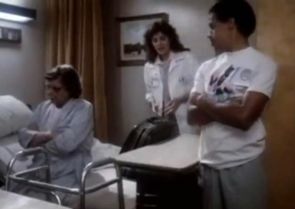 There's a brief scene where Dr. Annie Cavanero (Cynthia Sikes) checks in on a patient, an elderly woman who tells her in a racially insensitive manner that she refuses to go along with orderly Luther Hawkins (Eric Laneuville) until she finds out what the hell is going on at St. Eligius. Florence Halop was hired just for this one scene, but the producers saw something in her they liked, so they brought her back, and then kept bringing her back utni she had appeared eighteen times. Florence Hufnagel's repeated admissions to St. Eligius, each time with a more serious medical condition, became the one of the show's most prominent story lines by the end of the third season. Along the way, she gets passed from doctor to doctor until she has verbally assaulted every on-screen physician at St. Eligius. Halop was so good, the producers of Night Court hired her to replace the recently departed Selma Diamond as the wise-cracking bailiff Florence Steiner for the 1985-86 season before her death from cancer on July 15, 1986. Inspired by the other video clips around the web that are escaping takedown, I am presenting the continuing adventures of Mrs. Hufnagel on YouTube (for as long as I can). The series kicks off with her scene from "Playing God, Part 2".